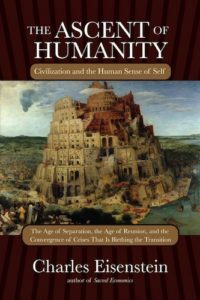 The Ascent of Humanity is about the history and future of civilization from a unique perspective: the evolution of the human sense of self. The Ascent of Humanity is about the history and future of civilization from a unique perspective: the evolution of the human sense of self. This book describes how all the expressions of our civilization—its miraculous technology as well as the pillage of earth, culture, goodness, and beauty—arise from our identity, our way of being, “the discrete and separate self”. The gathering crises of our age demonstrate that this way of being is on the verge of collapse. And this collapse is setting the stage for a revolution in human beingness whose stirrings we already begin to feel. The Ascent of Humanity is about Separation: its origins, its evolution, its ideology, its effects, its consummation and resolution, and its cosmic purpose. What is the purpose of the grandeur and the ruin we have wrought? If civilization is to collapse, Why? and What for? Will we then go back to the Stone Age, or will we be born into something entirely new? This book draws from mythological sources, as well as natural processes of birth and transformation, to offer a narrative framework for the majesty and madness of human civilization. More than anything, The Ascent of Humanity is about how to create the more beautiful world our hearts tell us is possible. I have long found most prescriptions for “what you can do” to reverse humanity’s trajectory of ruin quite empty. Recycle your bottles and turn off the faucet when you brush your teeth. Write your Congressman. What are these tiny individual actions against the juggernaut of destruction that consumes oceans, trees, soil, and culture? This book offers an entirely different approach that begins with the reconception of our very selves. It invalidates the logic of despair that so many activists have felt, that arises inescapably from the conception of ourselves as discrete and separate subjects in a world of other. This is the ideology of separation. The ideology that has created the human realm we know is the same ideology that has us despair we can ever change it. Wait, did I say “we”? I mean actually “you” and “I”. “We” is often disempowering too, because it leads us to wish, “Oh if only everyone would get it, then we would have a better government, better laws, and stop being so greedy.” But they don’t—how could I make them?—and the despair comes back. Helplessness. Frustration. This may be the only book you have ever read that fully gets the enormity of the crises facing us, yet responds neither with despair nor with fantasy suggestions about what “we” should do about it.